Thread: Ideas for these fabrics? Would love ideas for making these fabrics into a smallish quilt--probably throw size since I have only a small amount of the solid tan.....although I probably can buy more later (got it at my local Jo-Ann's which is closing to re-open in a larger location. They are liquidating their stock and so do not currently have this fabric). 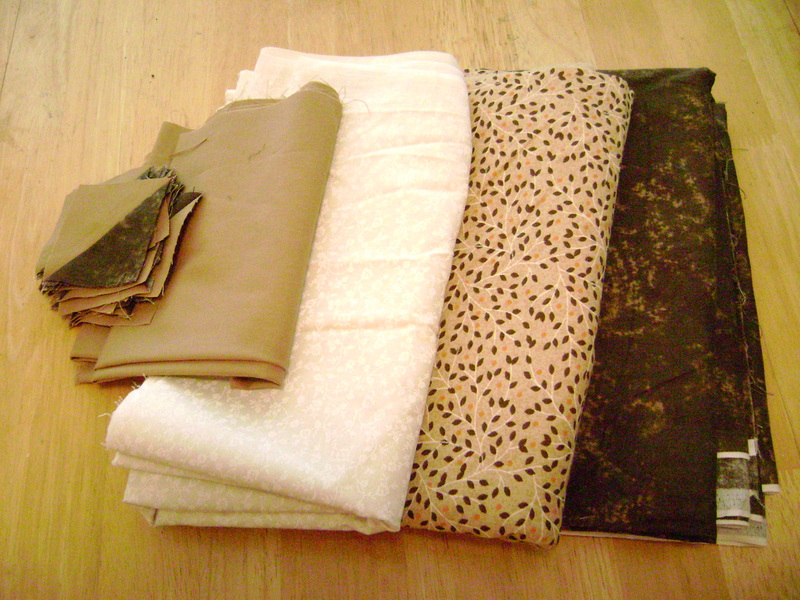 And speaking of that liquidation: At 75% off I bought $250 worth of fabric for $58 yesterday. At that, I restrained myself; could have bought so much more! One woman, who was there both days I was, had bolts stacked higher than her head. Occurred to me she may have been buying for her own shop; the sale may have been less than wholesale. Anyway, back to my request: I'd like to showcase the leaf print (2nd from right) in this group, but in any case, put these 4 fabrics together in a way that makes them all shine. I already have about 40 2.5 inch HST (also in photo) made from two of these fabrics, (from scraps of another project) that I'd like to use with these, but I'm not interested in making a lot more HSTs, either like the ones I have or from the other fabrics. (Yes, I'm lazy that way). Any ideas, friends? Will value any and all suggestions. This is where I get frustrated and stymied in quiltmaking. I fall in love with a fabric or a collection of fabrics and then get hung up on finding the Absolute Perfect Design for these particular fabrics......when I know--KNOW!-- there is no such thing as perfect, but that there is something that works and will be pretty! If you don't mind indulging my neurosis (I get very tired of it, myself), I need your help! Thanks in advance! I love that leaf print. Since you don't have many different fabrics to include, what about something in the "Irish Chain" family? A DP9 would look good with those fabrics also. I love those fabrics together. Be sure and post a finished pic. You could have fun doing a sampler quilt, using those fabrics. Pick one as a background and build from there. A great way to try different block patterns. Another possibility .... Carpenter's Wheel. It requires three fabrics ... the fourth could be used in the borders.